In the coming few days I hope to bring some light to any old-car despair you might be feeling, and share a string of cool and affordable survivor cars found on none other than the list that is Craig's. By the way, Craig Newmark is a real dude, and we all owe him a debt of gratitude for bringing free online automotive classifieds to the masses. As a resident of the San Francisco Bay Area in the early 2000s, I felt like I had an edge on the rest of the world with access to the OG craigslist site, and used it to furnish my rental house, find weird roommates, and browse cool cheap used cars long before the rest of the country. Progress being progress, I'm glad Craig and his team are slowly trying to take over the world, because it makes finding cheap survivors that much easier. Find this 1972 BMW Bavaria for sale in Ridgecrest, CA for $5,000 via craigslist. 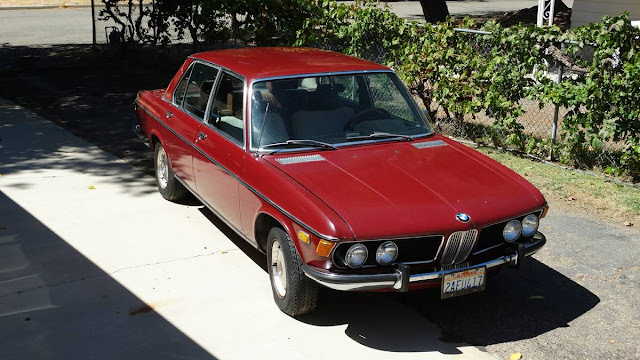 The Bavaria is a variation of the BMW sedan known as the E3 chassis, a fairly sophisticated car (for its time) that debuted several years after the Neue Klasse and paved the way for the 7 Series that would follow. The front end is shared with the classic E9 coupe, and personally I think it would be hard to design a better looking shark nose. This kind of survivor is the one you really want to scoop up if you're in the market for a project car. The paint and body looks almost perfect, with a few minor blemishes. It's located in the high desert so you can bet on little rust lurking underneath. 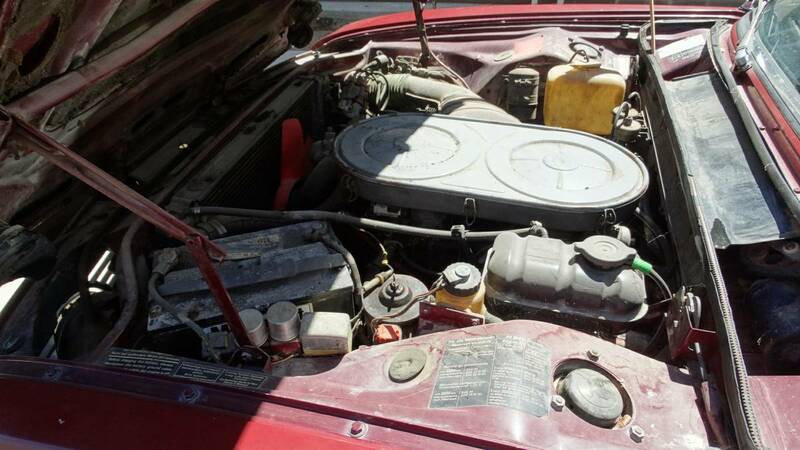 It needs mechanical work so the seller will be ready to make a deal. There's a claimed long history of ownership - the seller's grandparents being mentioned - which if it's true, likely means that the car was cared for even if it did sit idle for many years. The old M30 inline six is one of those simple yet silky vintage powerplants that should be easy to revive and rewarding to run up through the rev range as you manually shift through the gears in your stylish upscale tasteful sedan. The interior even seems really quite nice, actually, for a car that's been sitting. Why haven't I bought this thing yet? 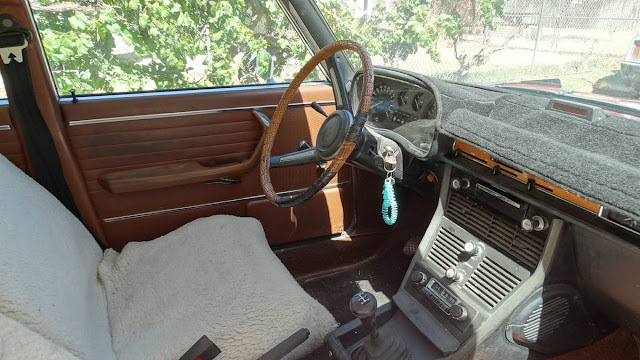 Either this car was originally equipped with an automatic and was converted to a stick shift, or more likely, someone replaced the original instrument cluster with a junkyard-sourced replacement from a car with an automatic, because the instrument cluster has the slushbox car's "P-R-N-D-2-1" indicator lights. Which means that the claimed mileage is not correct, though with a 5-digit odometer the mileage is irrelevant and nobody has any idea how many times it's flipped back to zero anyway. These are cool old cars, though, and when decently sorted drive amazingly well compared to other cars of their era. Looks like a pretty good deal. I think I agree with Cyberluddite on the instrument panel swap. It looks like the cut out the shift pattern, which belongs on the dash, and glued it on top of the shift knob. And I would guess by the time an automatic car was going to get a transmission swap, there would have been a 5-speed from a late E12, E28 or E23, not this 4-speed. To all those who think these are under-valued (like the idiots on Drive Network).. Here's proof that even in nice shape they are still "chump change". About 5 years ago one popped up on CL near me in condition similar to this and the price was listed for $25000. I called, had to ask the seller if he added an extra "0" by mistake. He then got mad and said TWENTY FIVE THOUSAND! I guess it was insulting to think it was $2500? 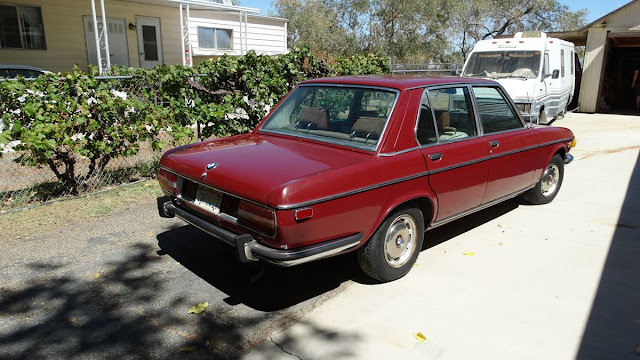 I mean, you could buy a good same-year Alfa Berlina for $5000, which is a much nicer drive, so why would anyone price one of these higher is beyond me.